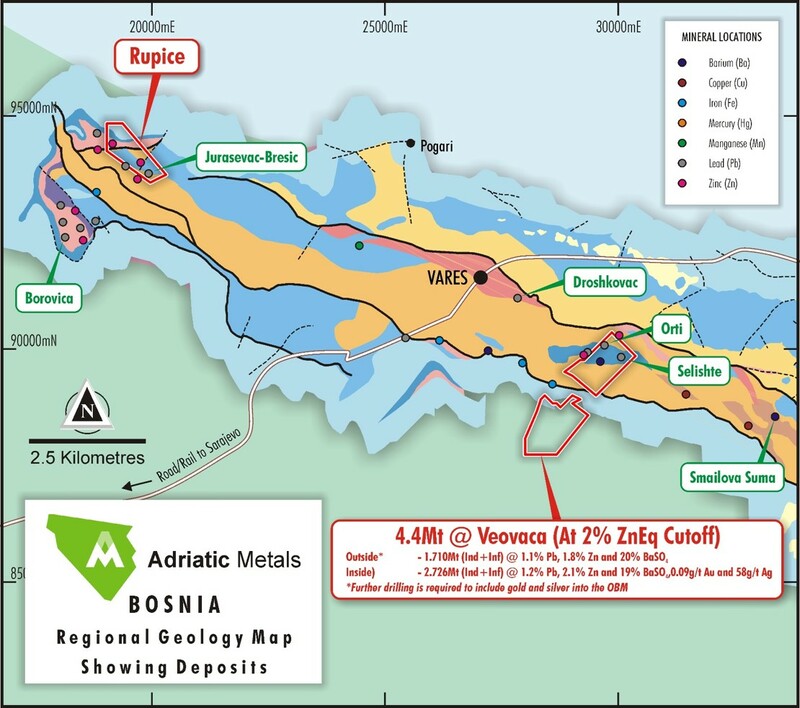 The latest analysis, performed by the UK-based Company Adriatic Metals, confirmed rich finding of gold, silver and other precious metals near the city of Vareš, in central Bosnia and Herzegovina. The company announced the results of the analysis from several test holes, drilled in the area of Rupice. “These drill hole results continue to demonstrate not only the exceptional grade, continuity and thickness of the mineralisation at Rupice, but also substantially improve our geologic understanding of this unique region. Our focus in early 2019 will be to extend the high-grade zones to the north and southeast and also to improve our understanding of the system between Rupice North and Juraševac-Brestić. At Rupice we will declare a Maiden Resource Estimate in the first half of this year. Also, metallurgical, geotechnical and hydro-geological studies are underway, which will feed into a Scoping Study, the Exploitation Permit application and ultimately a Feasibility Study. We look forward to a busy, and successful 2019”, Adriatic Metals Chief Executive Officer, Geraint Harris has commented. For example, the first hole intercepted a very thick zone of high-grade mineralisation over 72 metres, returning 18.3% zinc, 10.7% lead, 211 grams per tonne silver, 2.5 g/t gold and 2.5% copper from 206m, and 46m at 25% barium sulphate from 216m. Other holes show similar results, and in some cases the amount of gold goes up to 4,1 g/t and silver 479 g/t with certain amount of other metals. In November, the company announced its high expectations regarding the analysis of the material taken in this area. “BR-25-18 is an exciting hole because it has potential for extending the plunge mineralisation back to the south and into an area where there was no previous drilling. In addition to the Northern plunge, this will be a second focus area for Adriatic to expand the known areas of mineralisation at Rupice”, Harris had stated at the time.